As galactic armadas clash in quest of the ancient fleet of the Progenitors, a brutal alien race seizes the dying planet of Garth. The various uplifted inhabitants of Garth must battle their overlords or face ultimate extinction. At stake is the existence of Terran society and Earth, and the fate of the entire Five Galaxies. 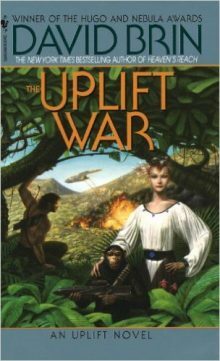 Sweeping, brilliantly crafted, inventive and dramatic, The Uplift War is an unforgettable story of adventure and wonder from one of today’s science fiction greats.